When planting trees or other plants, weed control in the root and canopy zone of the desirable plant is very important. Weeds will naturally grow next to almost any planted tree or other plant, and rob the plant of water, sunlight, and nutrients. The weeds can also serve as hosts for damaging insects and hide rodents that will feast on your plant. While there may have been no weeds in the undisturbed soil before tree planting, the act of disturbing the soil and watering a new tree encourages weeds to also take root. There were previously multiple options for weed control around new trees or other plants, none of them very good. Herbicide could be sprayed at the base of the plant to kills weeds, but for most plants (unless glyphosate resistant) this could cause as much harm to desired plant as undesirable weeds. Organic mulch could be used, but as this breaks down it forms a good soil into which weeds can grow. Fabric can be used , but this tends to slowly puncture and weeds will find their way through it. Recently, rubber mats have become popular, but these also keep rain from trickling down to the desired plants roots. As none of these options were previously very good, something else needed to be found. Enter the Groasis Waterboxx PlantCocoon, or Waterboxx for short. The Waterboxx was not invented as weed control - not at all. The Waterboxx was invented as a self refilling water battery for trees and other plants. filling up from dew and rainwater. This water is then channeled to the root of the growing plant. All of this happens naturally (without electricity) due to the ingenious design of the Waterboxx. A schematic cutaway view of the Groasis Waterboxx PlantCocoon, or the Waterboxx for short. Dew and rain are collected on the tan lid, funneled down the siphon (shown in red) to the green reservoir, and slowly released to the roots of the growing tree by a wick. No weeds can grow for almost 10 inches in any direction from the trunk of the small tree. The Waterboxx surrounds the trunk of the growing plant. Its central opening allows the plant to grow. The reservoir of the Waterboxx sits on the soil surrounding the desired plant. Here, in addition to preventing evaporation of soil moisture, it prevents weed growth around the tree or plant. For trees, the Waterboxx is removed after 1-2 years, after the tree is well established and has a large canopy that will block out weeds at the base of the tree. For annual plants (like tomatoes, peppers, melons or other cucurbits), the Waterboxx is left in place for the life of the plant, preventing any competing weed growth. A giant sequoia growing over two years with the Waterboxx in Indiana - no weed pulling or external watering was every needed for this tree, even after the Waterboxx was removed. 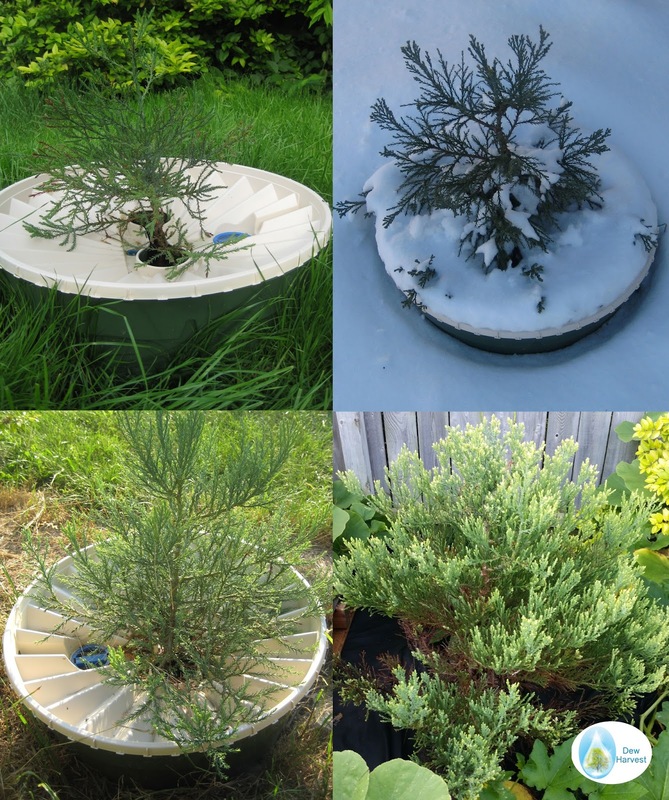 The Waterboxx is made of food safe UV resistant plastic and can last for up to 10 years, so it can be reused for several trees or for a decade in the garden. It can help eliminate herbicide use, and allow us all to plant a more green, living world. The Waterboxx can allow us to plant trees that grow so large as to combat our own personal carbon dioxide emissions. Finally, the Waterboxx can allow us to plant trees in areas long considered too dry for trees. Learn more about the Groasis Waterboxx PlantCocoon here.